The child oriented animated program, Bob the Builder helps young people deal with life's learning situations. A construction theme is used to demonstrate how to handle conflict and cooperation with others. Amiable socialization is an important skill children learn as they develop. As children develop through the formative first five years, this pre-school program entertains as well as teaches children ways to handle difficult situations in their little lives. These talking vehicles are an innovative way to grasp the attention of young viewers. Bob the contractor has friends who are all different kinds of construction vehicles. Once presented with a problem, Bob presents it to his friends and asks, Can we do it. His friends in turn answers back, Yes we can! This same question and answer jingle is part of the program's theme song. Bob's friends all have different attitudes that resemble how people look at problems. Scratch is a small digger is eager to impress what he can do. Gripper and Grabber are cranes that work together to solve problems. Tumbler is kind and gentle, but demonstrates strength. Although Flex likes to impress others, he will do his best to work together. Bristle is very tidy, but friendly. Splasher is the only vehicle that can perform on land and water. Packer the delivery truck is very enthusiastic and follows direction. Dodger the milk trucker works well in a group with his friends Packer and Scrambler. Scoop the digger accepts challenges and assumes leadership. Muck the digger/dump truck has some issues being messy and fear of the dark. Dizzy the cement mixer has a lot of clutter and doesn't mind living meagerly. Ridley the steam roller keeps everything happy by making up and singing songs. Lofty the crane always rises to keep things going. Ginny the small digger always likes to learn new things. Travis the tractor is always ready to help Bob with the problems he brings to the group. All the vehicles don't participate in every problem. The situations shows how there are different skills needed to resolve certain problems. Bob the Builder is a British television broadcast that is televised in over thirty countries. When Mila appears on a TV game show, Bob and friends build an outdoor movie theater so everyone can watch. The team gets ready for a winter festival. Bob gives sleepy Scoop a day off while the team builds an ice cream stand. The team has to use explosives to demolish an old factory. Bob and the team build a rocket for a movie about space robots. Muck can't wait to meet Dash Lightning when they work on the set for his latest film. When Saffi wins a contest, the team builds an elephant statue based on her drawing. The machines race to complete a clock designed by the Rockets. Scoop leads the way when a heavy storm damages the Fixham Lighthouse. Leo has to finish Spring City's monorail, but he has trouble staying focused. Episode 7 - What A Team! Pilchard hides in Bob's bag and ends up at Chef Tattie's restaurant. The zoo's new giraffe runs off when Lofty accidentally knocks down his fence. When the team builds an elevator in a skyscraper, Scoop decides to take a ride. Scoop gets a fun idea for mixing concrete after visiting Chef Tattie. Leo boasts that he's a great skateboarder even though he's never skated. When the team builds a motocross course, Bob decides to enter a race. Lofty needs to pick up a ghostly decoration for Halloween, but he's too scared. Leo tells a spooky story that frightens the Rockets. Bob and the team build a car wash and get a visit from Mayor Madison and Mr. Bentley. The machines prepare for a checkup from Curtis the mechanic. Scoop can't wait to meet the sea life center's new baby shark, and he wants to take her for a walk. The team finishes up a bridge in Spring City. Episode 1 - On the Job! Bob and friends plan a surprise for Curtis's birthday. The team works hard to finish a new ice rink so the Rockets have somewhere to play hockey. The team builds a shelter out of recycled material. Bob the Builder is currently available to watch and stream on PBS. 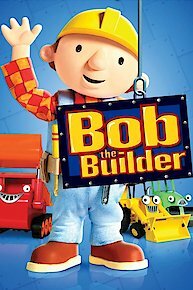 You can also buy, rent Bob the Builder on demand at Vudu, Sling online.